The VNDK requires several changes to a codebase to separate concerns between vendor and system. 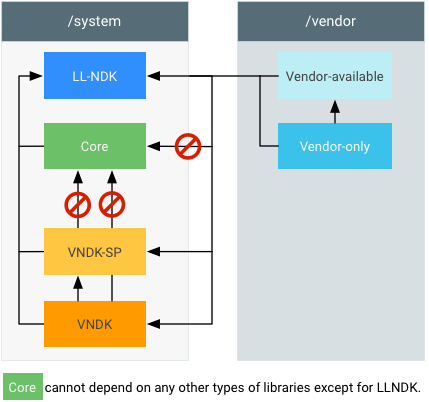 Use the following guide to enable VNDK in a vendor/OEM codebase. Figure 1. Build system libraries. core. Used by the system image, on the system image. These libraries cannot be used by vendor, vendor_available, vndk, or vndk-sp libraries. vendor-only (or proprietary). Used by the vendor image, on the vendor image. image (may contain duplicates of core). vndk. Used by the vendor image, on the system image (a subset of vendor_available). vndk-sp. Used by the system image indirectly, on the system image (subset of core). llndk. Used by both the system and vendor images. Once for platform (and thus installed to /system/lib). Once for vendor (and thus installed to /vendor/lib, /system/lib/vndk, or /system/lib/vndk-sp). Determine eligibility by calculating the required sizes of vendor.img and system.img partitions. Enable BOARD_VNDK_VERSION=current. You can add to BoardConfig.mk or build components with it directly (i.e. m -j BOARD_VNDK_VERSION=current MY-LIB). After enabling BOARD_VNDK_VERSION=current, the build system enforces the following dependency and header requirements. The dependency can be removed. If the core component is owned by vendor, it can be marked as vendor_available or vendor. A change making the core object part of the vndk may be upstreamed to Google. In addition, if a core component has dependencies on a vendor component, the vendor component must be made into a core component or the dependency must be removed in another way (for example, by removing the dependency or by moving the dependency into a vendor component). Global header dependencies must be removed to enable the build system to know whether to build the headers with or without -D__ANDROID_VNDK__. For example, libutils headers such as utils/StrongPointer.h can still be accessed using the header library libutils_headers. Some headers (such as unistd.h) can no longer be transitively included but can be included locally. For details, refer to private/android_filesystem_config.h. For hard-coded AIS, include cutils/android_filesystem_config.h.